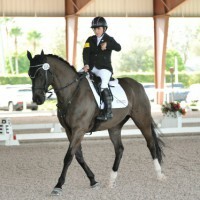 Sydney Collier briefs us on the basics: Para-Equestrian 101. Photo by Lindsay Y. McCall. Phew! Spring is FINALLY in the air, the iceberg known as the East Coast seems to be thawing, and I am over the moon! I am thrilled so many of you enjoyed getting to know me in my first blog. Since I spent my first blog introducing myself, I decided I probably should fill you in on what the heck this para-equestrian stuff is all about. I am a para-dressage rider, but there are many para disciplines covered by the United States Para-Equestrian Association so if I don’t answer your questions you can look them up and get yourself or your friend headed in the right direction! Some of you may know a bit about para-equestrians, but for those of you scratching your head right now and going “hmmmmm,” here is a brief and concise (as possible) look into our world! This leads me to a funny story about one of my very first talks a few years ago. Journey and I walked into a third grade classroom buzzing with excited chatter and laughter. We worked our way to the front of the room while curious whispers and a slow silence followed us like a lazy morning fog. I smiled and took my seat while Journey gazed out and admired all his potential future “dog-patters.” I listened as the teacher introduced us to the group of eager students. I began my talk with my favorite question: Who out there thinks they know what the word “para” in para-equestrian stands for? Well, you know what they say: “Out of the mouth of babes!” This little girl’s frank response and question is actually an answer echoed in almost every talk I have given. I love it; I WELCOME this answer because it speaks to the heart of what is a para-equestrian. After a good giggle and some limb wiggling, we all agreed I was indeed not paralyzed in the conventional sense, but I assured them I was qualified to be a para-equestrian and I explained why. “Para” actually means parallel and our disciplines (in my case specifically para-dressage) follows the same conventional training, rules and regulations that you know and love. “Para” does not literally define our bodies but rather our sport; a sport created to be PARELLEL to our able-bodied disciplines DESPITE our physical disabilities. Meaning, in its simplest form, para-equestrians perform their equestrian sports (which include dressage and driving at the FEI level, and the up-and-coming reining and show jumping) at a level parallel to each other and our able-bodied peers. In the case of para-dressage, at its highest, international (FEI) level, we represent our country, as the sole equestrian discipline, at the Paralympics. OK—parallel, you say—interesting, but how? How do you create a parallel system despite the presence of disabilities? Because as the little girl noted, I may not be paralyzed, but I am in fact physically challenged. Here is where we introduce you to the classification system. Each discipline in para-equestrian has a classification manual that is recognized at the national and international level. Inside this manual is a series of profiles determined by various physical tests that are used to place riders into grades. This is a key fact; to be classified as a para-athlete you must have a permanent and measurable physical disability that is classifiable per this manual. And once this has been established by physicians and specialists forms, tests are then carried out by doctors and physical therapists trained accredited by the FEI. You might be surprised to learn that (hey, it’s Fun Fact Number 3) all these tests are completed 100 percent off the horse! Unmounted testing is key to our sport. Classification is a statement of FACT regarding an individual’s physical performance, not rider SKILL. It creates grades of riders (grades 4-1a) that have similar functions allowing them to compete at a parallel level in the ring. So, when you look into a ring of 1b grade riders, you may notice that many riders don’t have the exact same recognizable disability, but our classification system has determined that they fall into the same profile of function to allow them to compete against each other. So now, just like in the able-bodied ring, the rider and horse with the best SKILLS (for that day, in that moment, with the horse whose on the same page) will win! But does this mean we are restricted to only showing in para classes? No, its just means we are classified at a grade to compete in the para competitions but you might see us in your able bodied classes too! Now that you understand the basics about what a para-equestrian is, the next thing you might wonder about is what is that strange-looking (insert name of unknown item here) that you see a para rider using in the ring. Hello, compensatory aids! Compensatory aids are items para riders use to compensate for a physical limitation due to their disability, but they DO NOT enhance the riders skill. These items are determined by your grade level, approved during your classification, and are STRICTLY regulated by the FEI for the safety of the rider and the horse. Some aids don’t look very interesting or noticeable (which we paras love), such as rubber bands on our boots to keep our feet (which we often can’t feel or control spastic leg movements from occurring) from falling out of the stirrups. Other aids actually might be the absence of an item that creates problems for our bodies, such as riders who don’t use any stirrups. Some aids compensate for missing or non-working parts like short reins or bar reins for one-handed riders. And still other aids just look plain old wacky (but are really wonderful) like the whip I use, for instance. Fun Fact Number 4: I often joke that my whip looks like my mom ran over it in the parking lot, so it definitely raises a lot of eyebrows on airplanes when she begs not to have to put it in the overhead bin where it might get bent! But, my wacky whip, which I hold with my right (and only working) hand, actually crosses over my lap, down over my left thigh, and then acts as my left leg (which checked out from being a team player when I had my stroke). These compensatory aids—whatever they are, or shape they take—provide no advantage or assistance to increase the skill level of the rider. Instead, they simply allow a disabled individual to ride (a parallel level) regardless of the limitations presented by their body. As a matter of fact, you might be surprised that most para riders try to use as few compensatory aids as possible because sometimes less is more when it comes to our bodies working in different ways. And hey, its one more thing to remember on a busy show day! So there you have it: para-equestrians in a nutshell. There are many, many more details but understanding the basics is a beginning. What I hope more then anything though, is that I have highlighted the most important part. We might physically need to do things a bit different, but we follow the same pathway as our able-bodied peers. We work hard, dream big and, we love our horses with all our hearts and souls!